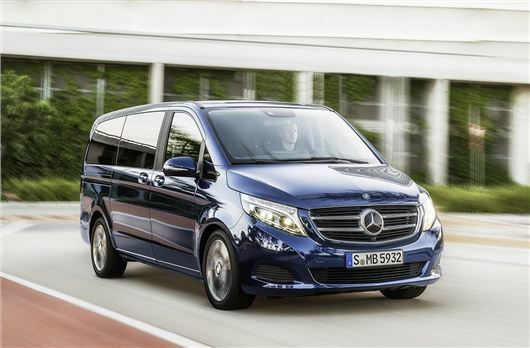 Mercedes-Benz has announced the details of its new large, eight-seater MPV model - the V-Class. Mercedes-Benz has no pricing details yet, but expect a start price of around £35,000 when sales start in early 2015, replacing the Viano. While the new V-Class is based on van underpinnings and has a van-like exterior profile it has been designed as a luxury vehicle, with lots of typical Mercedes-Benz details both eternally and internally. The most striking feature is the light design, which uses the same LED arrangement as the flagship S-Class luxury car in the press images – though this is not standard on base models. The flanks of the car and the boot are both far more typical of van based MPVs, though, with sliding side doors and a large, top hinged tailgate, which can optionally be specified with a configurable electronic opening mechanism. This means the owner can specify a maximum opening height for low roofed gargages. The interior features high-quality materials and is designed to be as practical as possible. There are eight seats, all of which are large enough for adults and can optionally be trimmed in Nappa leather. Up front the dashboard layout is similar to that of the new C-Class luxury saloon, with a large touch screen and wooden finish. Various practical extras are available, including an optional table between the two seats in the middle row and a choice of bench seating arrangement or individual seats, which can be turned to face one another. Additionally the rear tailgate glass can be opened independently of the hatchback door, which is useful in tight parking spots. There’s a full range of active safety systems on offer, which would normally be associated with luxury saloon cars. Among the gear available is active cruise control, full-LED headlights, high-beam assist and collision mitigation systems. Pre-safe is offered, which detects an imminent collision and activates the seatbelt pretensioners and prepares the airbags. Most V-Class models will use a 220 CDI diesel engine with 163PS and 380Nm of torque. Fuel economy for this engine is 49.6mpg with emissions of 149g/km. Buyers can also buy a more powerful 250 BlueTec petrol engine with 201PS and an impressive 480Nm of torque.